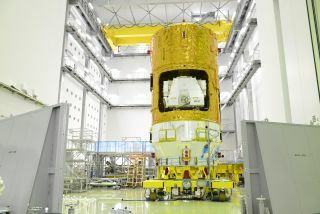 The Japanese H-II Transfer Vehicle-7 (HTV-7), as seen in July 2018 during preparations for its launch. Update for 4:30 p.m.: The Japanese Aerospace Exploration Agency has delayed today's launch for an undisclosed reason. A new launch date will be announced when it becomes available. After nearly a week-long delay from a typhoon, a Japanese cargo ship will launch toward the International Space Station today (Sept. 14) to deliver tons of fresh supplies for the orbiting lab's six-person crew, according to the Japan Aerospace Exploration Agency. The robotic HTV spacecraft will carry more than 5 tons of supplies when it launches into space atop an H-IIB rocket from Tanegashima Space Center in southern Japan. Liftoff is set for today at 4:59 p.m. EDT (2059 GMT, 5:59 a.m. local time on Sept. 15). The launch was originally scheduled for Sept. 10 (Sept. 11 local time), but was delayed by a typhoon near the a JAXA monitoring station in Guam. The capsule, an H-II Transfer Vehicle called HTV-7 and nicknamed "Kounotori," or "White Stork," will carry a wide range of supplies for the International Space Station itself, as well as materials for the scientific experiments being conducted aboard the orbiting laboratory, according to a statement released by NASA. A particularly important item on White Stork's packing list is a set of six new batteries. Astronauts are scheduled to replace batteries currently placed on the space station's exterior with these new batteries during spacewalks in late September. The capsule is also carrying an experimental re-entry capsule that Japanese scientists hope will make it easier to return science experiments from the space station, as well as cubesats designed to test space elevator technology. And, of course, the cargo will include plenty of new experiment materials for the astronauts to begin using. Those items include infrastructure for dealing with potentially hazardous materials during experiments, an experiment that will study bone marrow growth in microgravity, and a device that aids glass and metal manufacturing in space. After the capsule's delivery run is completed, the spacecraft will leave the space station and burn up in Earth's atmosphere over the Pacific Ocean. Before the weather-induced delay, the spacecraft was scheduled to launch on the ninth anniversary of the H-II Transfer Vehicle program's first launch. If the agency is forced to postpone the launch again, it has a range of launch opportunities until Oct. 31 to fall back on.